Superman! This guy was my super hero when I was in class two. I remember me running out of the bathroom holding the towel behind my back. The only that was missing then, was the blue dress and the red underwear. Yes! I was indeed a super kid. My dream of wearing a full fledged superman attire never came true. Even last week when I turned back and went down memory lane, I discovered that 26 years of disappointment was following me and mocking at me. I could not take it any longer. I soon decided that come what may, I am gonna wear the superman dress this morning for my early morning jogging session. 4) A pair of red socks. Next morning I woke up and dressed myself. 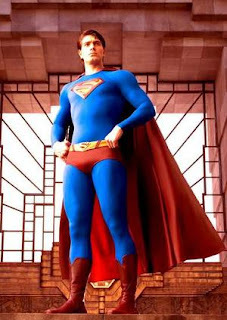 I knew that I was not wearing superman's undergarments (the blue shirt and the blue pants). But nothing could dent my spirits. Soon I was ready for my early morning jogging. I would have just jogged 10 metres outside my home when three dogs started running towards my direction. The very next moment, I was safe inside my home.The dogs waited outside the gate for sometime and all three of them peed on the gate and left the scene. let me make it clear. so u went jogging wearing a pair of socks (yes,red) and a towel (tied to neck). hmmm...its a miracle that u escaped from the dogs. so was that lost red undy ur's then? LOL! when you're being superman, why would you go jogging? p.s: you do know that there are costumes available, right? p.p.s: thanks for stopping over at my blog! neighbours are still jogging and dogs are not chasing them,.. can you throw some light.. why>? what happened to ur blog? I thought you are using your under wear. There fore u must have it rite? I used CAPS to really show it's mine. All I need is money for petrol. buddy why dint u put up YOUR picture in that attire over here instead of the real superman pic!..